Second Annual Horsepower Car Show Saturday Sept. 8th. Mid Peninsula Wine Trails Mid Summers Wine Walk is this weekend! Experience 5 wineries all within one block of each other. Domenico, Flying Suitcase, Russian Ridge, Old County Cellars Saturday & Sunday, and Zoetic (on Saturday only). Domenico opens at 11.am and Old County Cellars closes at 5:30 the others are noon to 5pm. We are open from noon to 5pm both Saturday and Sunday. Come and see what San Carlos Wineries have to offer. All in a stroll around the block! 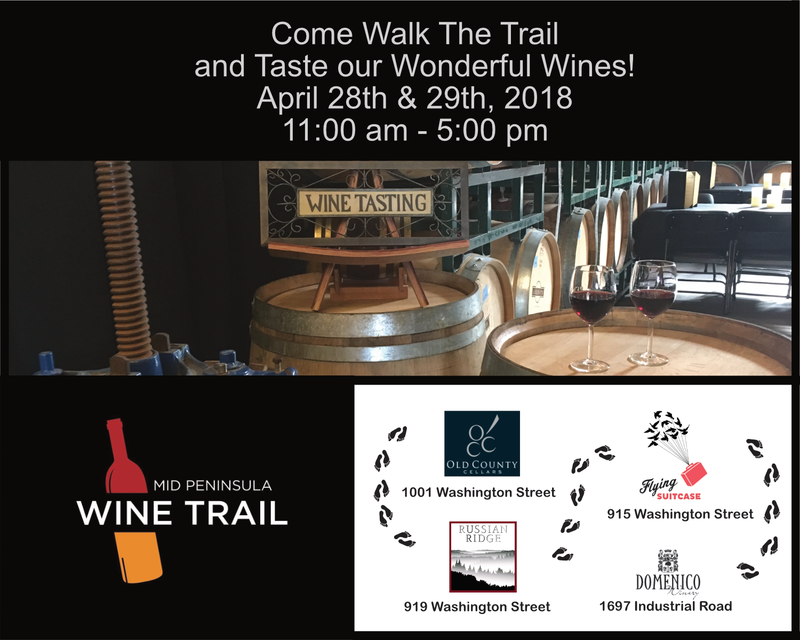 Russian Ridge Winery is happy to open our doors an hour early along with Flying Suitcase Wines, Dominico Winery, and Old County Cellars to serve up the best on the peninsula! April 28 & 29 from 11 am – 5 pm. Now including two local vendors! You’ll get the chance to shop sea glass jewelry and upcycled totes while you choose the wine for your weekend or pick out a Mother’s Day gift! Russian Ridge Winery and Geoffrey’s Diamonds and Goldsmith are partnering to bring you a golden opportunity. 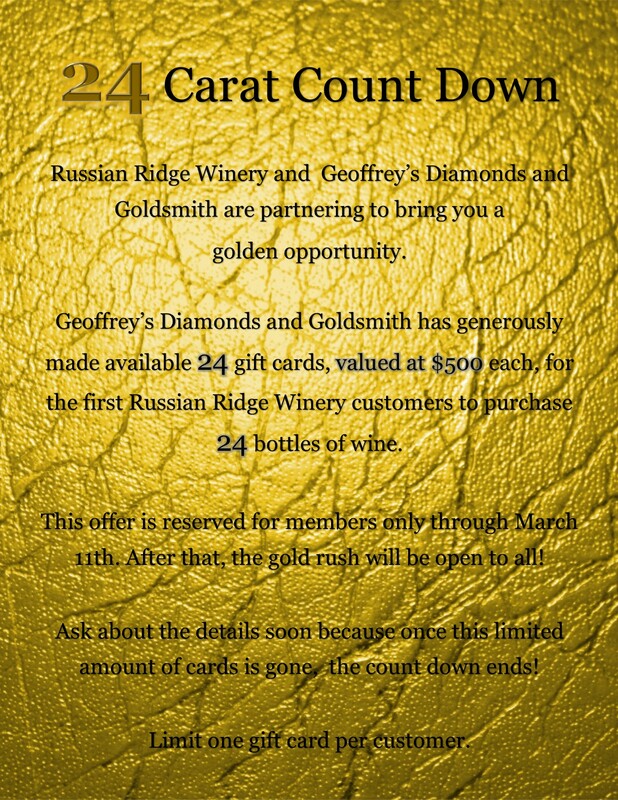 Geoffrey’s Diamonds and Goldsmith has generously made available 24 gift cards, valued at $500 each, for the first Russian Ridge Winery customers to purchase 24 bottles of wine. Ask about the details soon because once this limited amount of cards is gone, the count down ends! Limit one gift card per customer. April is Wine Club Pick up Month! April is pick up month! Spring into the Tasting Room for our 2016 Barbera and 2012 Cabernet Sauvignon. It’s a rosy red array that will make your heart blossom. Remember, at any time in the month of April, you receive an additional 5% off on top of your club discount on all wine purchases. You may have heard about the 24 Carat Count Down, but it is now down to the 18 Carat Count Down! It’s such a good deal, this is practically a heist! Geoffrey’s Diamonds and Goldsmith has generously made available 24 gift cards, valued at $500 each, for the first Russian Ridge Winery customers to purchase 24 bottles of wine. Get yours before the rest are gone! We are proud to members of the Mid Peninsula Wine Trail. The Mid Peninsula Wine Trail is happy to announce that on Saturday July 22 and Sunday July 23 will be having our first Wine Trail Weekend. On Saturday, at least five neighborhood wineries will be pouring and on Sunday, all eight wineries will be pouring from noon to 5pm. This is a great opportunity to get to know your local wineries. All within walking distance. How great is that? Save your self a 2.5 hour ride north to Napa or Sonoma. We are right here in your neighborhood. Uber/Lyft in and home for a no hassle day. Pick up a copy of Edible Silicon Valley Summer edition while you are out tasting. Come and see what San Carlos Wineries have to offer and then enjoy dinner downtown San Carlos. Saturday April 22nd we will be pouring at the Los Gatos Wine Walk. Saturday May 6th from 12 to 1pm we will be co-hosting a stop with Devils Canyon brewing for a car club. 75 to 80 cars expected. Silicon Valley Wine Auction Grand Tasting. Saturday June 3rd we will be pouring at the Menlo Park Wine Walk. Sunday June 11th We will be pouring at the San Carlos Wine Stroll. We are very happy to announce our awards from our wine submissions to the San Francisco Wine Competition. Stop by and see what we are pouring this weekend.